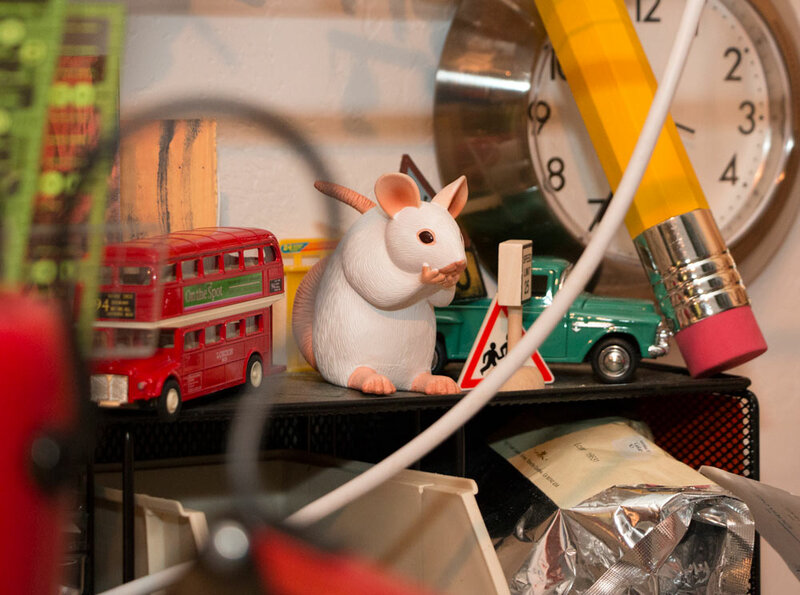 I thought I’d share a few random details from my natural habitat (aka The Studio). And, just like my studio, it will have no particular order. 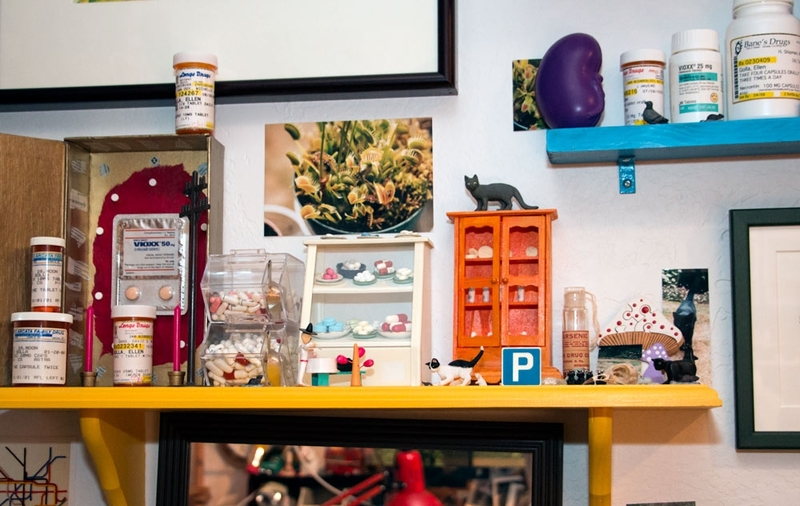 This shelf features a few parody “pharmaceuticals,” among other things. There are also bottles from real (now withdrawn from the market) pharmaceuticals I’ve actually been prescribed, as well as souvenirs from when my husband was sent to (the now infamous) Dr. Moon of Redding many years ago… The purple rubber kidney was a gift from a good friend in memory of her late husband who’d been on dialysis. 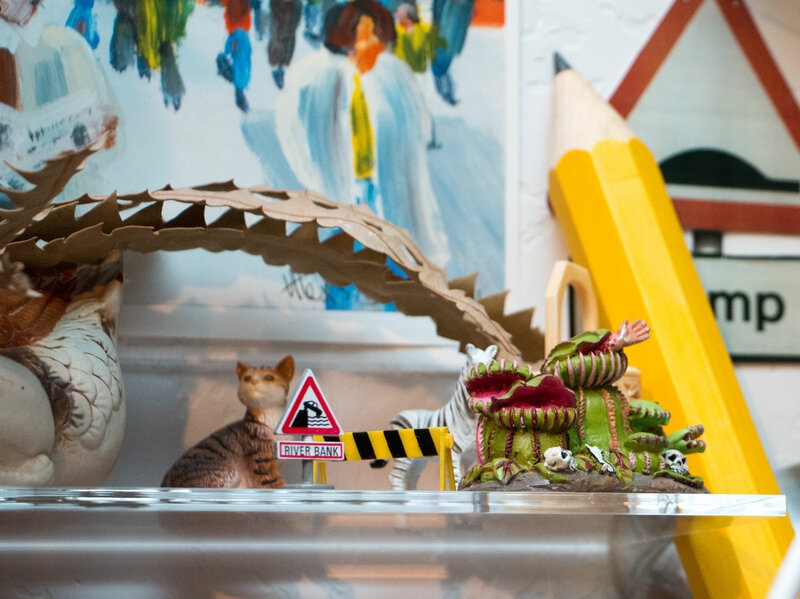 This is another shelf. It features… stuff. 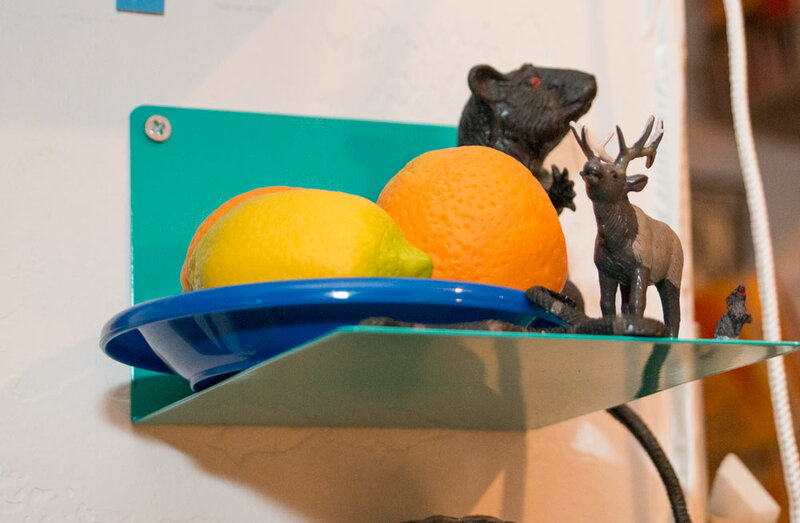 Bookends with flat backs make excellent little shelves when mounted to the wall. Thread… Almost as bad a fetish as the one I have for paper. 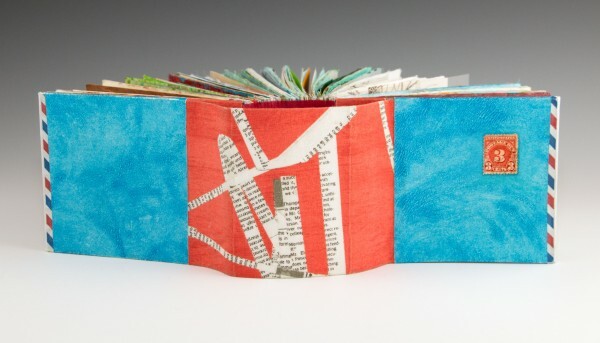 I have come to appreciate the difference good, beautiful thread makes on the overall quality and look of a handmade book. And, at least for me, a spool can last for years. *Supply note below. Drawers are a bit of a fetish too. This is a close-up of the one above near the raven. (Yes, the proximity of “Knives” to “First Aid” was intentional). 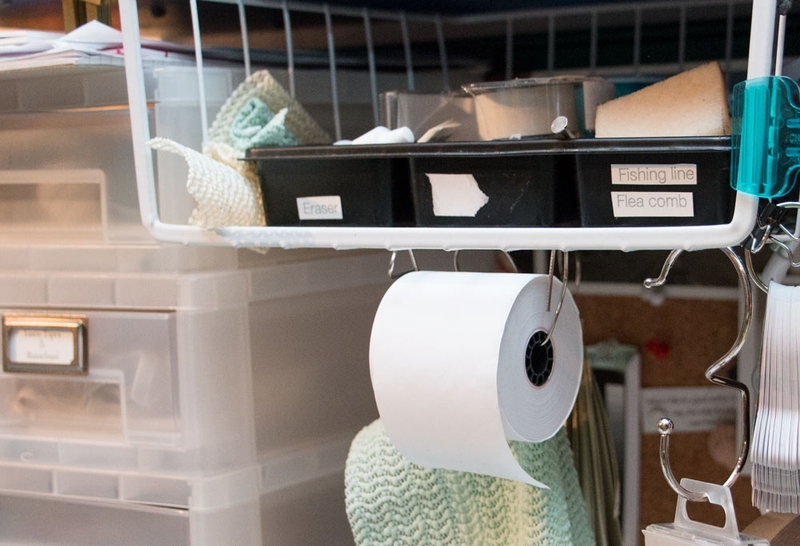 This little roll holder is made from a large paper clip. 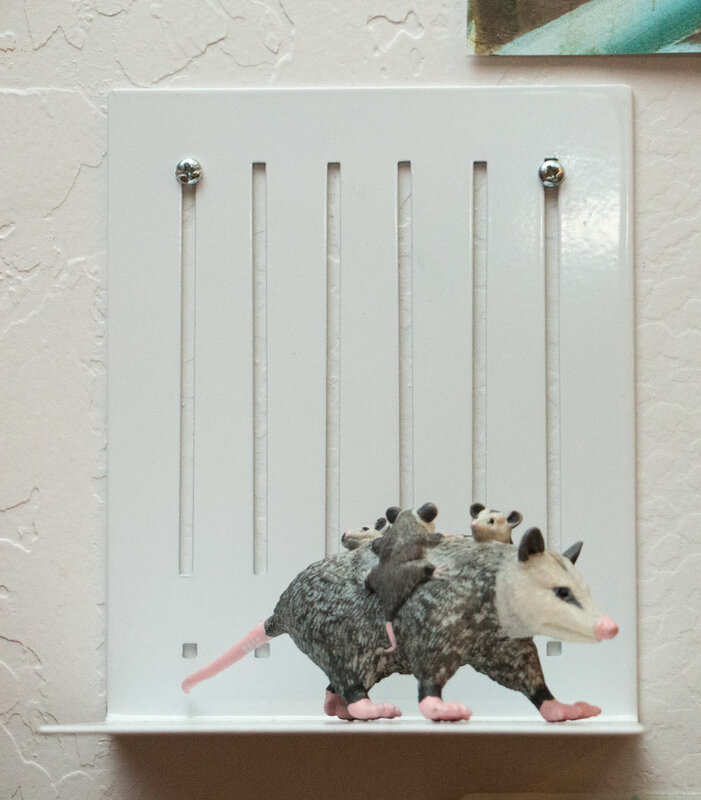 It’s attached to one of those wire shelves that hangs under a shelf. The receipt paper is great for notes and for folding mock-ups of book pages. Nearby hangs a metal strip with some magnets. The magnets are strong enough to hold some of my tools. These needles are a pack of darners sized 1-5 from the craft store. 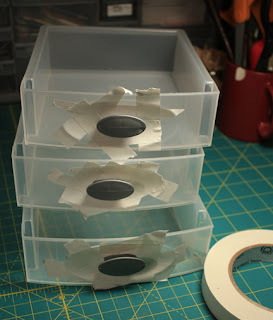 They’re cheap and work well for bookbinding. (Although Buechertiger has also gotten me into harness needles, which are not so cheap, but, depending upon the size, are strong, nice and big (but not too big) and dull-ended — perfect for someone with clumsy hands like me. Still, I have a fondness as well for my darners. 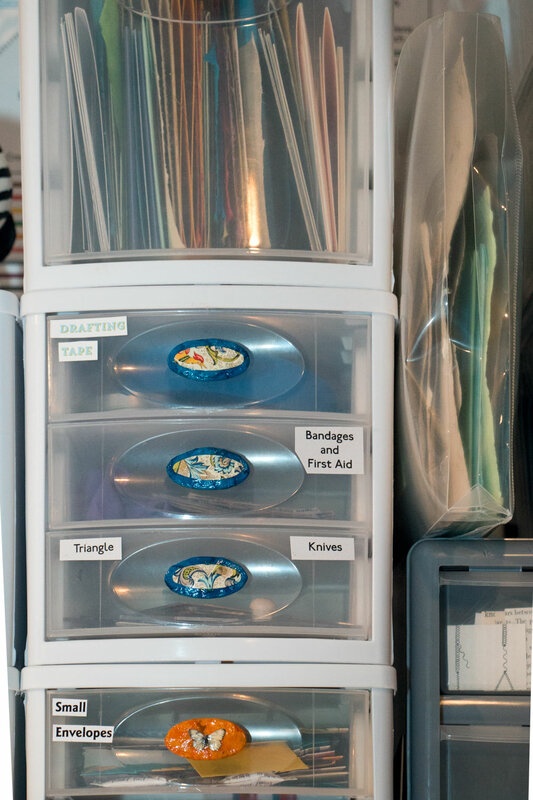 Mesh desktop organizers are great for holding rulers, and it’s easy to put screws through them for hanging. 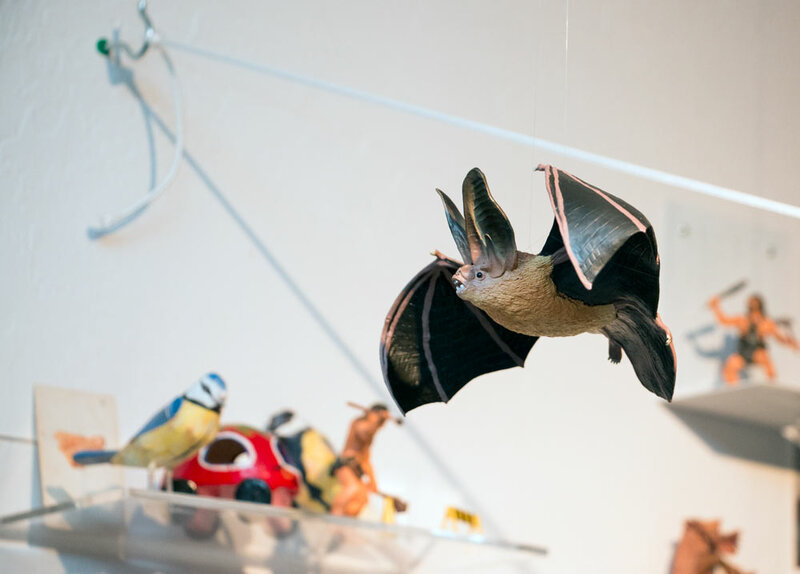 This one is hanging from a shelf. There’s another, smaller one meant for holding business cards mounted next to it. It holds bone folders. Evidence of actual work in (on again-off again) progress. I really have not forgotten about those Book•Art•Object editions! Life has interfered in great ways with me getting them finished. But my goal for this year is to finally do that. This is Superstition. Or, rather, the second time around with Superstition. I almost finished the entire edition well over a year ago, but a technical disaster (among other things) struck. It all had to be scrapped and redone. A tale of angst I have not yet brought myself to write about. 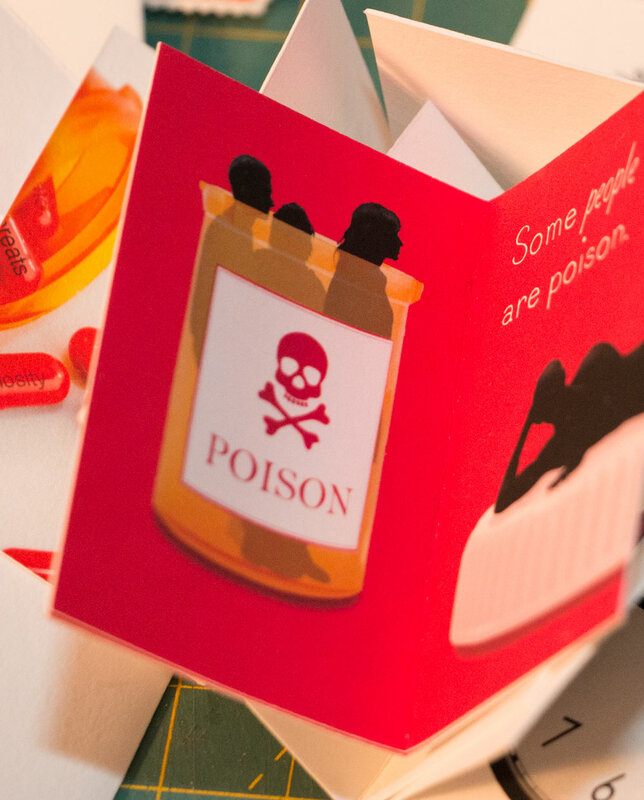 Here’s also a sneak peak of “Poison,” which is a little simpler to assemble. I’m hoping to finish it first. Yes — they really are printed, and have been for over a year (the copyright date printed on them is 2013!). Alas, extended time in the studio when I’ve been lucid enough to work has been hard to come by. As it stands, more delays are ahead, including another scheduled visit to my favorite far away medical complex(es)… But I do plan to be gluing some “Poison” spines before then (… she types, while knocking on her wooden desk). 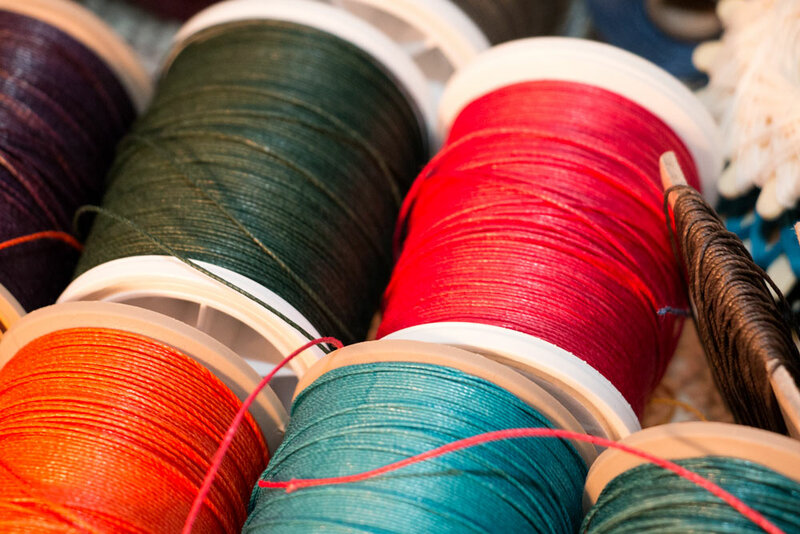 *Supply note: An excellent source for high-quality unwaxed (and other) linen threads is Buechertiger’s supply shop on Etsy. We’re friends (full disclosure), but I’m also a happy customer. Things have been getting “interesting” again, alas, in the dual-degenerative disease household realm. I’ll spare you the details. I haven’t been able to be in the studio much. It’s making me grumpy, and unfinished books are still sitting… unfinished. Along with other projects I @#$% want to get to. But what can one do. 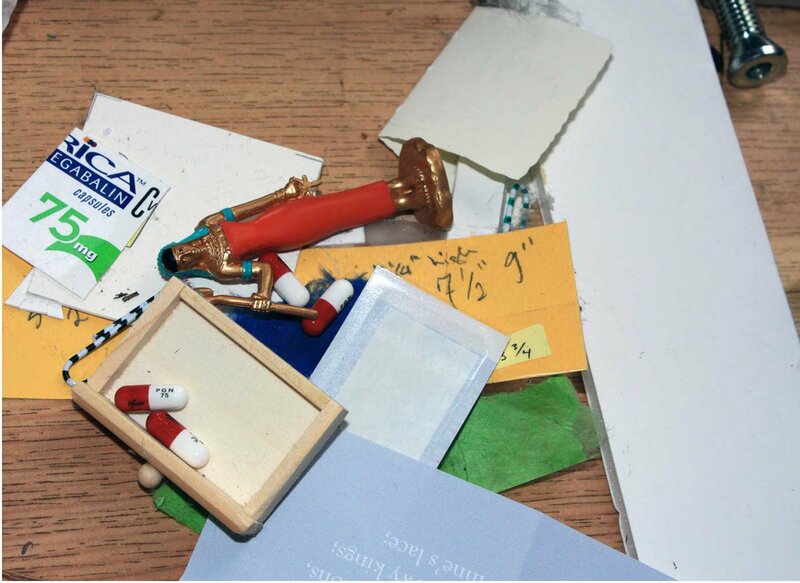 Notebooks full of postage stamps. I have, however, been finding solace in, of all things, the piles of postage stamps I’ve been gathering and hoarding for years. I decided to finally sort them out so I know what I have. 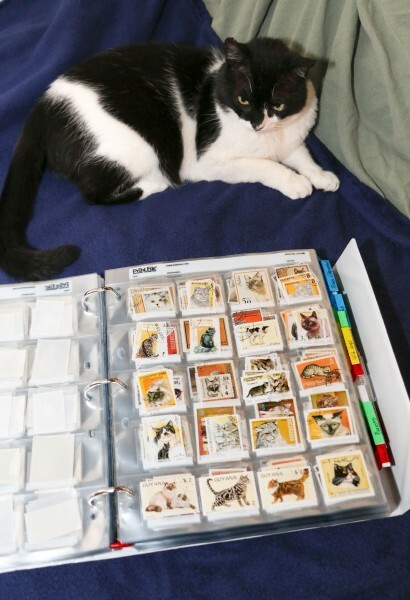 Sorting stamps is mindless and can be done sitting on the couch. It’s also strangely relaxing. I’m putting them in slide sleeves in notebooks, arranged by subject matter and, for some subjects that fill many sleeves, by color as well. 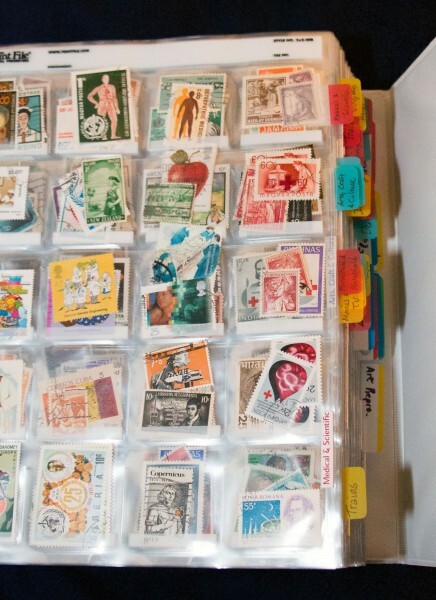 That makes a lot more sense for finding stamps to use in art and craft projects than, say, sorting them strictly by country (although there are some pages of that sort too, when no other category seems to fit). 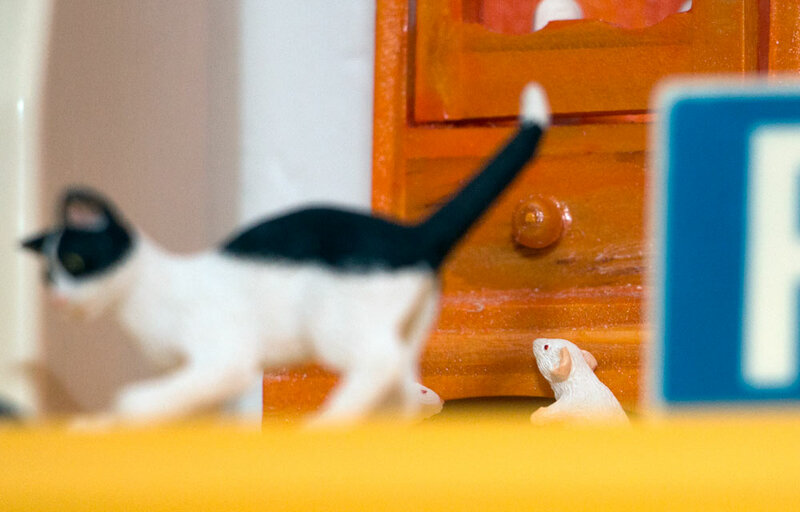 Dominic eyeing some yellow/orange-themed postal cats. The cover of the latest plaything. I realized recently that my 5th blogiversary came and went in March during my extended blog absence. Since time seems to pass in a blur lately anyway, what’s a measly four months? Let’s have a belated celebration! 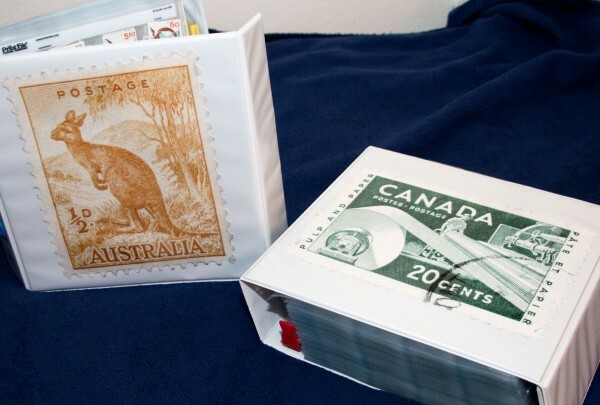 Leave a comment, and I’ll send you a little philatelic surprise. 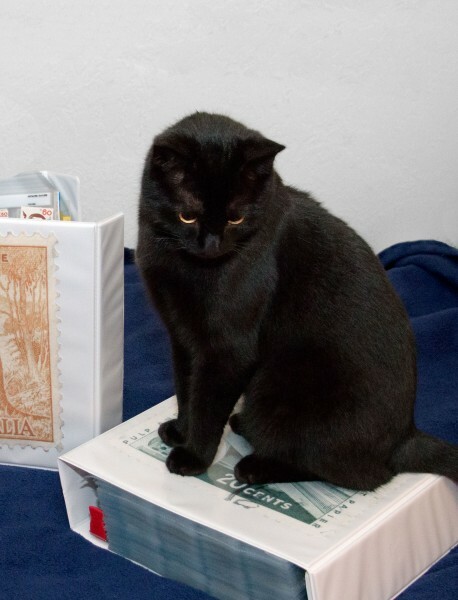 I will also randomly draw one of you to get a somewhat bigger philatelic surprise as well (see this post for a hint). Deadline to leave a comment for the giveaway and drawing is Wednesday, July 16. Steve is always quick to help. PS Thank you all for the outpouring of compassion after my cat Larry’s death last month. I was, and am, so touched by the heartfelt messages I’ve received, both here and privately, even from friends I’d had no idea subscribed to this blog. Thank you. It means more than you know. One night as I was flailing with gunk-covered hands for some freezer paper or waxed paper or some such, inspiration struck. 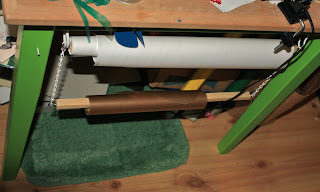 The resulting roll holder has worked so well, I thought I’d post pictures. 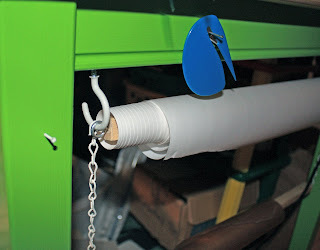 The whole thing hangs down from underneath the side of a table, so it doesn’t take up any space. 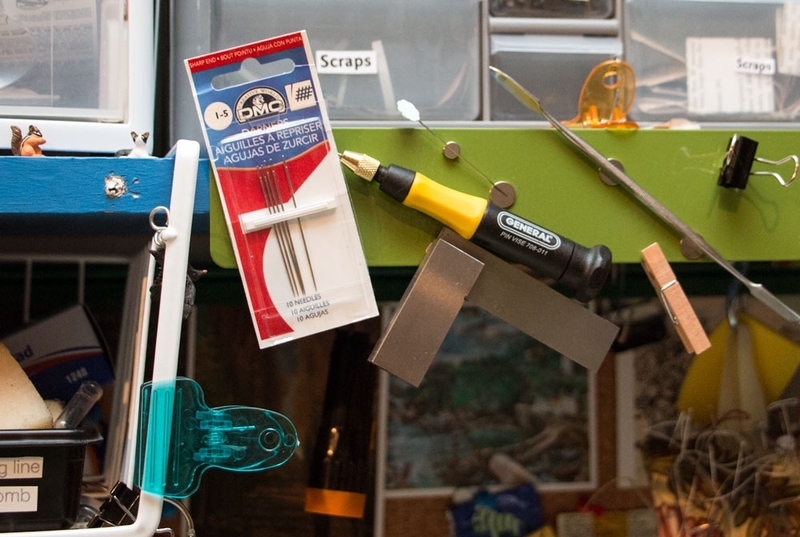 There was also already a nail above, and that turned out to be perfect for holding a letter-opener type cutting implement, which is great for slicing off pieces of freezer paper. 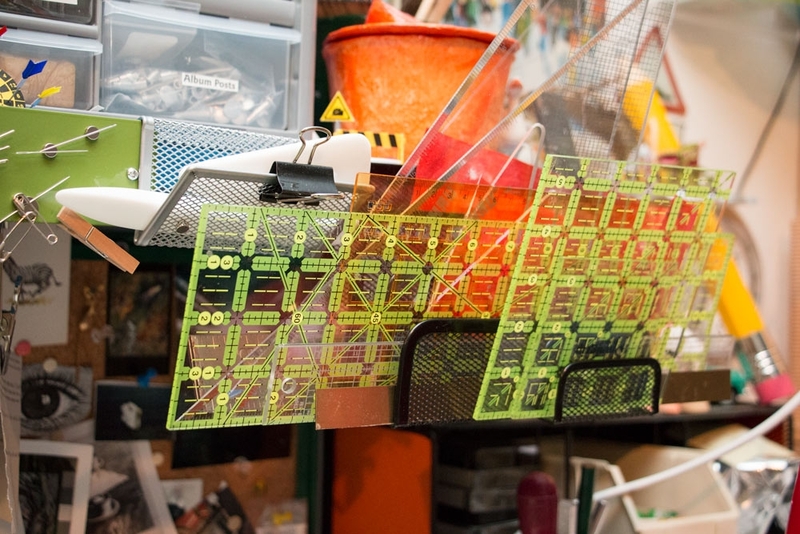 The green stuff on the tabletop in the first picture is some used stencil material. It doesn’t have anything to do with storing rolls of waxed paper. As I say to every visitor, don’t mind the mess! This is so Martha Stewart-ish it’s embarrassing. 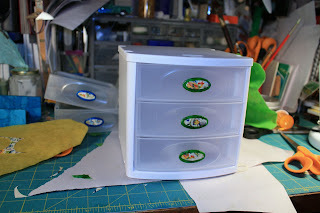 I decoupaged the knobs on my little plastic organizer drawers. Since I recently got another one, I thought I’d provide a tutorial. First, mask around the knobs. 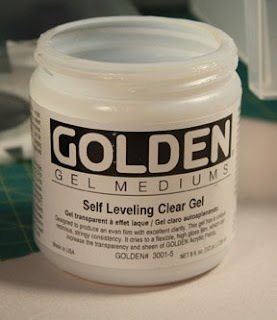 I use Golden Self-Leveling Clear Gel as both adhesive and final coating. It holds up well. I’ve had a set of these drawers in my bathroom for years, and the knobs are still fine. 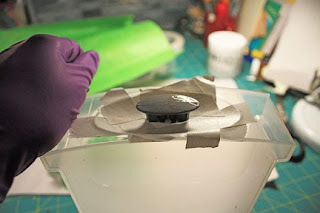 Since these particular knobs are a little rough in texture, it holds the gel and doesn’t flake off. Tear up bits of paper. 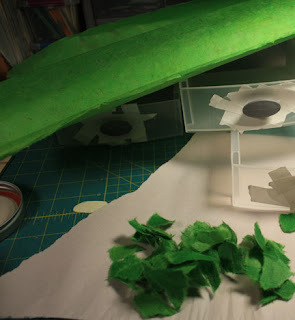 Thin papers that are easy to mold around things when wet are best. This here is Nepalese Lokta (a fabulous all-around paper). Various Japanese papers work great too. Brush on a coat of the self-leveling gel. I recommend wearing rubber gloves—it makes this much easier and neater. 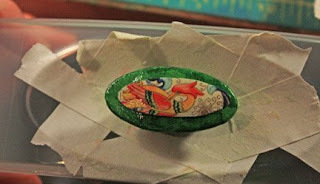 Begin to layer on the paper, using a thin, even coat of the gel. 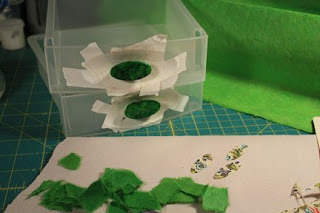 After you’ve completely covered each knob, let them dry overnight. At this point, you could finish up by applying another couple of coats of gel, drying completely between each one. However, I had some nice Italian paper sitting around, so I thought I’d add a final touch with it. 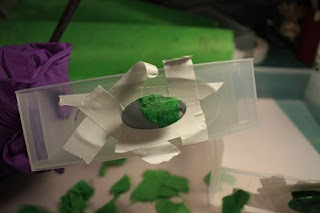 I cut out pieces shaped to fit on the knobs, and adhered these on top using the same self-leveling gel. I then brushed another coat of the gel on top. I left them to dry overnight. I then added another couple of coats, drying thoroughly (preferably overnight) between each. 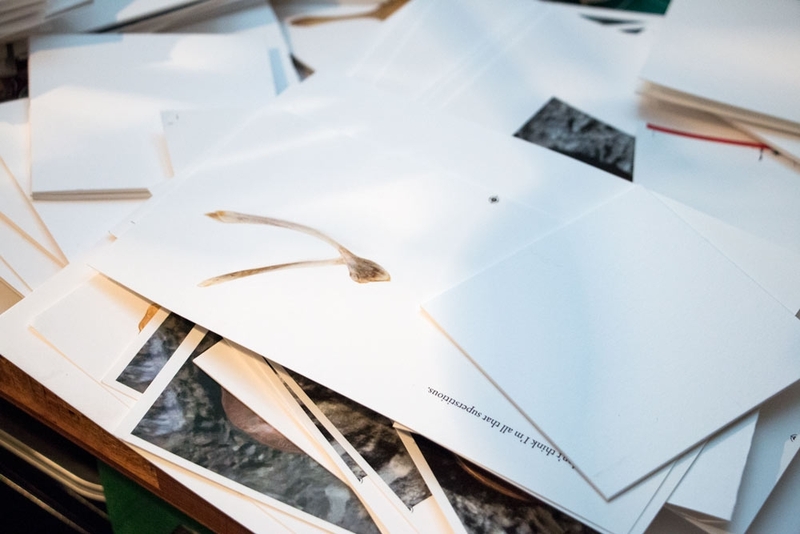 Much to my amazement, we didn’t find many black widows in the studio the other day, but instead found all kinds of other things that had fallen behind furniture and storage boxes. Cleaning my work space feels as futile as going down to the beach and attempting to bail and organize the Pacific, but I guess one has to start somewhere. Part of the problem is that I sometimes do use things like leftover packaging and scraps of paper, so I can rationalize having things like that around. But one needs limits. 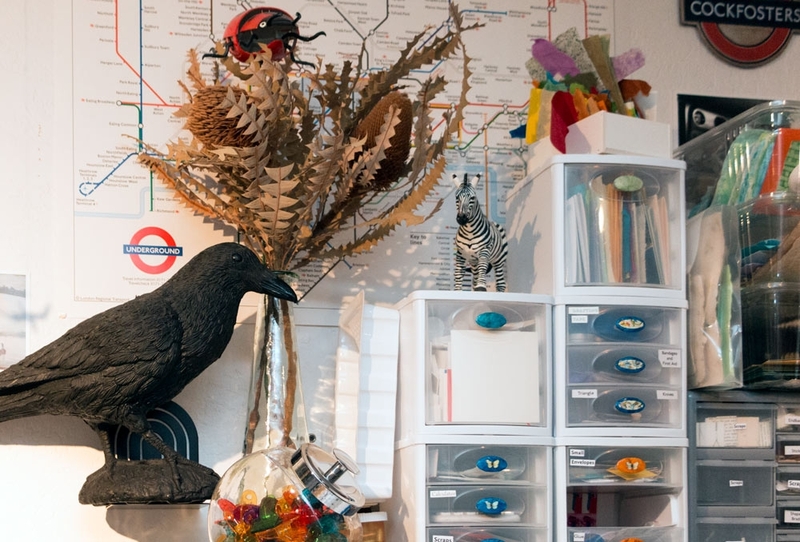 I discovered a while ago that those 3-tiered plastic bin organizing things designed for kids’ bedrooms are useful for messy, visually-minded artists. I’ve had one for a while and have grown fond of it. 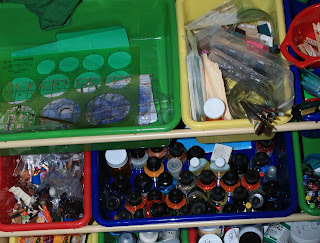 I keep rulers, inks, glues, small toys (for assemblages, of course), etc in it, and it works great. I like having things out in the open where I can grab at them. Several of these ladies share my studio (which is a converted garage) with me. I have nothing against them. They don’t actually bother me much (I like spiders). 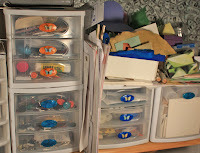 However, given that black widows like to live and hide behind boxes, and that my studio is filled with . . . er, boxes, I’ve decided it’s time for the arachnid equivalent of U-Haul (well, that and the fact that one was running past my toes when I looked down the other day). 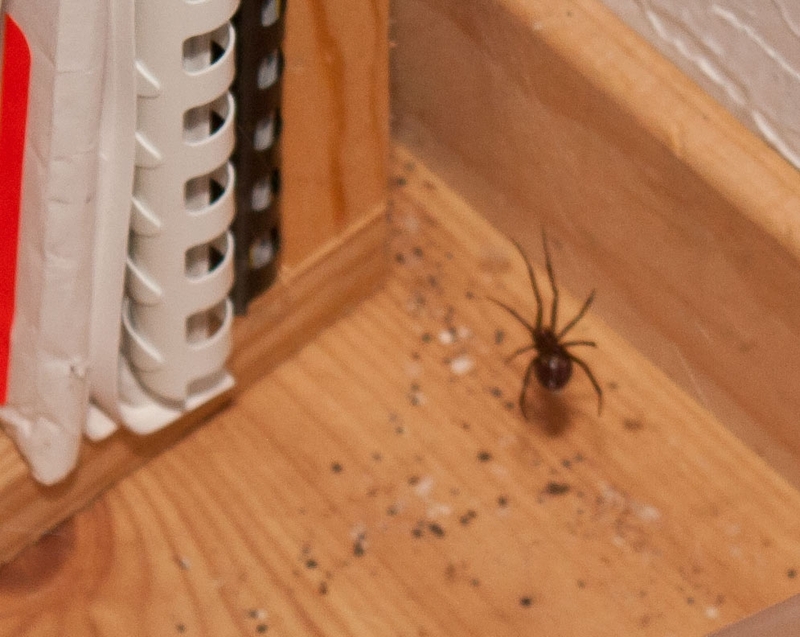 So, tomorrow I’m hiring somebody to come over to help with black widow removal (nobody wanted to volunteer—go figure).